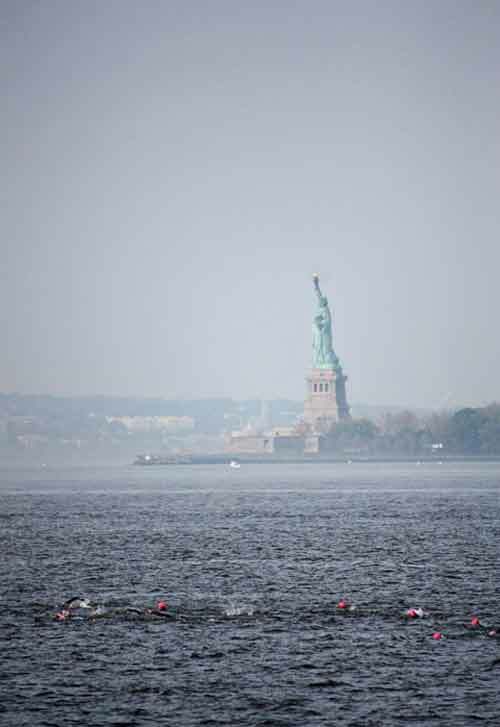 The Great Hudson River Swim is NYC Swim’s kick off event of the season. 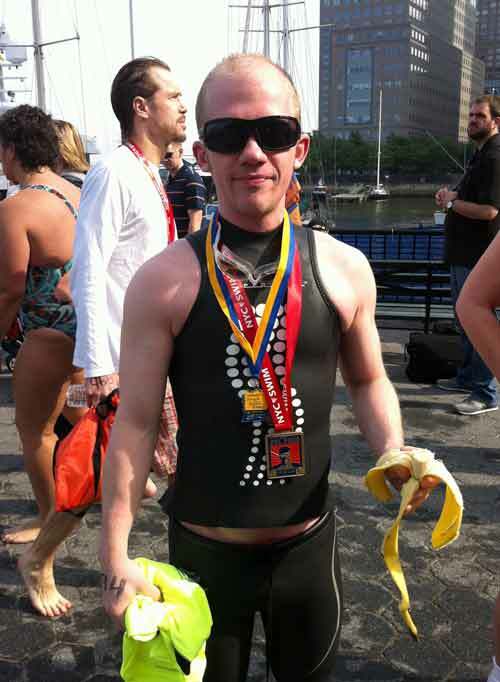 It is a 1.6 Mile swim from the Christopher Street Pier down to the North Cove Marina in Battery Park. We examined the water conditions that night and it was crazy choppy! Awake at 6AM and Cafe Bustelo began coursing through our veins! Abbe, Todd and I left at 6:30 to walk up to the start. It was a beautiful morning. We checked in and grabbed a spot in the grass on the pier. My friend from previous races, Elik, came by and said hello. 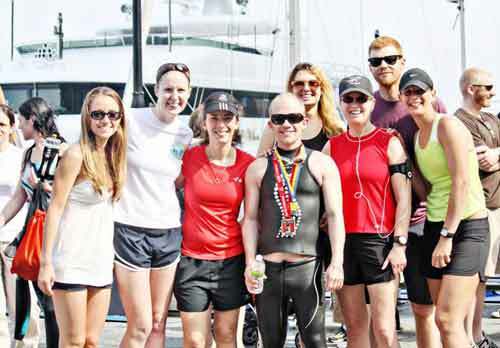 Then, out of nowhere, Jess, Rick, Maria and Maura H. were there to support me! Awesome! (it turns out, as you will see in the end, Abbe had set up a little surprise cheering squad for me!) After high fiving everyone I made my way to my wave. 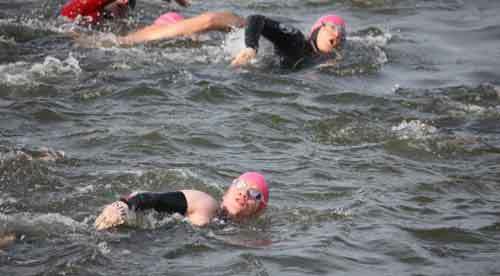 I was in the first, meaning I am in the slowest group of swimmers. This is just something I have learned to deal with, fast on land… slow in water… FOR NOW. Todd and our friend Sam were in the last Wave and I told them to take it easy on me as they passed by during the race. Todd said he was going to dunk me. Fantastic. Right before jumping off the pier into the water I looked back and saw a few more of the Runner Army waving! What was going on? I had to wait maybe 1 minute before the Wave Start sounded. I dug in and started my race. My only goal was to finish. It had been a hard week and I did not need to stress out. Something very scary happened as we swam along the pier before cutting out left into the river. I didn’t have it in me. I was rotating between freestyle and breast stroke and my mind was racing. It had been one week since my Dad passed away (almost to the minute) and I was bummin’ out. 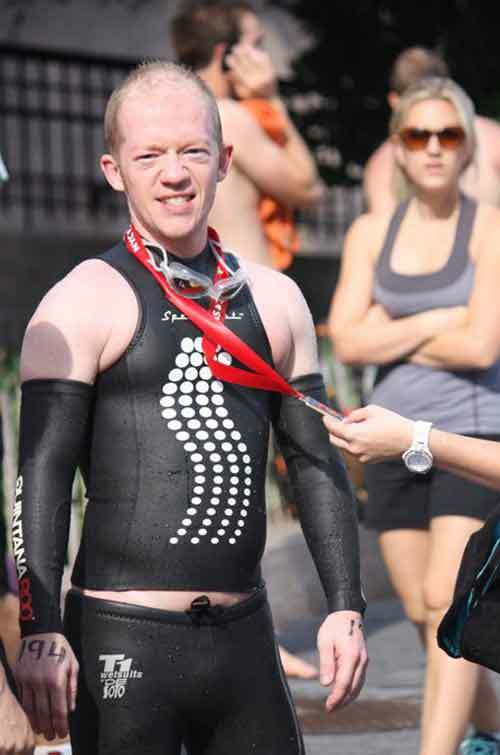 At one point I was just said “F this.” and looked over at the pier for a way up to take myself out of the race. I’m not one for giving up, so I gave it a few more tries and I slowly got closer to the turn buoy, knowing that once I got into the river it was sink or swim. Before my Dad passed away, as I was saying goodbye to him one of the things I told him was that I would race every race for him, in his honor, until I couldn’t race anymore. With my face in the murky cold Hudson, with nothing to listen to but my air bubbles and my stream of consciousness, I thought of that. Before I knew it, I had made the left turn and was in full swim form, cruising down the mighty river on a beautiful sunny day. I focused a lot on my form and all of the knowledge bestowed upon me by Coach Sonja and Swim Guru Sean. We had come a long way in the 2 months I had decided to take them on to help me, this was the first test. I was still not taking this race to heart as a competitive event, so on occasion I would pop into breast stroke to enjoy the peace and quiet. Maybe it’s because in NYC we never had silence, but I am always so amazed at the peacefulness of swimming ¼ mile off the Manhattan shoreline. I am also amazed at my fearlessness in comparison to the last 2 years. I knew I would finish and I knew there was no possibility of drowning. I thought to myself “Enjoy this.” and I did. 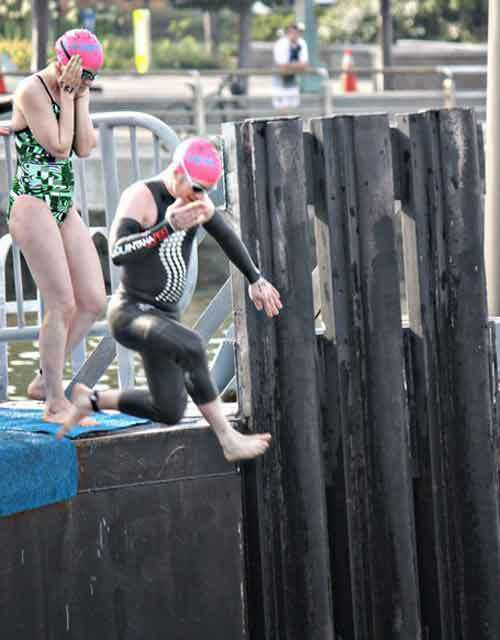 As I finished the swim, popping out onto the dock, I hear a loud cheer in the distance “Baker!” A large portion of the Runner Army had come out top support me and cheer me on! I was thrilled! After they hosed me down, I came around for some serious high-fives. Role Call: Maria, Maura H, Susan, Elyssa, Erica Sara, Matt6, Steph, Jess, Rick, Claire, and Abbe! Time: 43:39, 10 minutes faster than the year before! PR! I found Todd and Sam and we high fived. Before we all headed out for coffee, Maria (my Reach the Beach Team Captain) presented me my honorary finishers medal and tee-shirt. Due to my Dad getting sick so fast last week I had to bail on the relay. This gesture made my day, it was so nice of all of them and they pretty much rock. 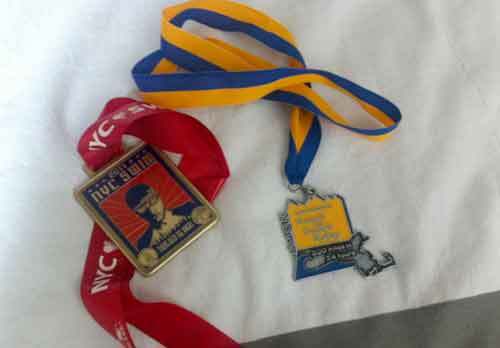 Also, now I had 2 medals… who else had 2 medals?! There was a lot of love floating around that day, thanks everyone!